1907 is taken as the date in which Cubism was born, when Picasso and Braque met each other. `Les Demoiselles d’Avignon´ is the painting considered to be the precursor of the movement. After that, Picasso forgot any kind of artistic depiction different from the cubism. The name was given to the movement after the words of the critic Louis Vauxcelles who said that the forms were `strange cubic forms´. -Plans are independent and autonomous: smaller ones break big volumes. Lines around break the images and when the lines themselves are broken the image remains a kaleidoscope. -Perspective is multiple: each plan is autonomous. The angles multiply and in this way we can see the object from different points of view, all together. -Light and shade disappear: this is a consequence of the dissolution of the volume. -Local colour: Colour is not important. It is applied through small brushstrokes and it is valid for any object. -Geometrization: Compositions are full of geometrical shapes. Any natural depiction is represented through cylinder, cone, sphere, or cubes. Cezanne had pioneered this idea. -Philosophical basis: the work of some philosophers as Bergson is essential to understand this movement. He said that a person has in his brain a lot of information about an object and the experience is the basis for intellectuality. 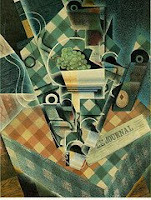 Cubist painters apply this concept: they do not want to represent reality, but the ideas they have about that reality. The main representatives of the movement are: Picasso, Braque and Juan Gris. In a different level Robert and Sonia Delaunay and Leger did Cubist works too. There are three different periods in Cubism: analytic, hermetic and synthetic, that developed in that order. 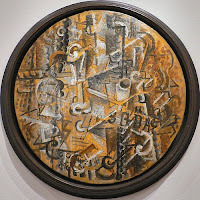 -Analytic Cubism: Artists investigated nature to distort and deform it. All the works are a collection of different plans completely impossible to understand. -Hermetic Cubism: Artists aimed at making their works easier to be understood, so that they included some elements that would be identified such as musical instruments. During this period some realist elements appeared too, as printing characters, numbers, newspaper pieces, or labels. They wanted to transmit the idea of a combination of different materials by imitating wood or marble. -Synthetic Cubism: Collages are included in the works as a sculptural antecedent. They do not imitate things, but they glue them to the canvas. These works are known with the name `papier collé´. Braque was the first using this technique through which he aimed at linking art and life. It offers the possibility of having a real reference. Painting is revised and new ways are opened for the artists. Now they are not limited to painting but they built in some way. This technique paved the way for the third dimension and for the sculpture. These collages would be influential on the Dadaist work, where the `ready-made´ produced by Duchamp are the heirs of them. Cubism influenced in some other movements and artists too. 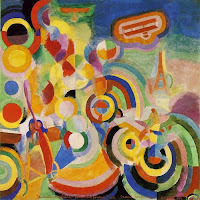 Leger produced works in which colour had a bigger importance while Sonia and Robert Delaunay produced works with simple shapes of harmonic colours, developing an style known as orphism, full of curve forms and lyrism.